Custom designing and manufacturing PC and console gaming chairs and accessories, the products from Chairs For Gaming are only available directly through their online e-commerce platform. Chairs borrow design elements from high performance chairs from the business world as well as the racing community, giving customers the opportunity to enjoy advanced ergonomics and space-age materials. 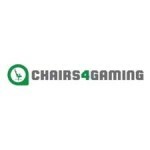 Chairs For Gaming offers their own in-house financing packages for each of the products that they produce, with no order minimums required whatsoever. 0% APR financing is available for those that meet certain credit check requirements. Free shipping is included on every purchase from this company.